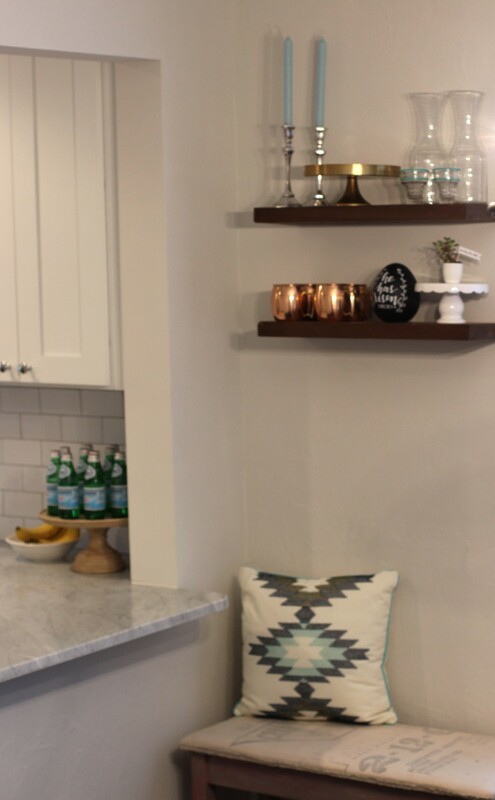 Floating shelves are a great addition to any kitchen or room. My sweet husband created these shelves from reclaimed barn wood purchased from a local salvage shop. Get the play-by-play to create your own..
For this project we found a reclaimed piece of cedar. The board was still rough-cut on the narrow sides, which I thought would add an interesting texture to the shelf. The broad sides displayed lovely grain pattern, perfect for staining. Before starting the project, we had to make sure we could locate two studs to mount the shelves to. 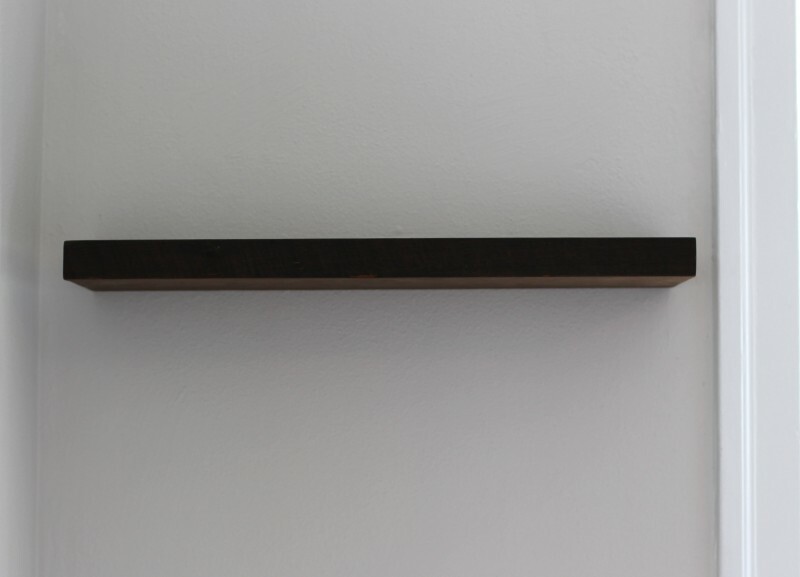 While other types of floating shelves can be mounted in drywall using heavy duty anchors, our design requires a minimum of 2 studs. Usually, studs should be located every 16 inches, so as long as your stud is longer than that you should be ok. However there are exceptions, and homes do not always follow the rules. Try to find your studs before you start drilling. Unfortunately for us, the walls in our home are covered in very thick plaster, and a stud finder does not work well. To find the studs, we simply drilled tiny holes every 1 inch along the wall until we hit the studs. Studs are 1 1/2″ thick so if you hit one drill a little left and a little right to find the edges, so you know where the center is. At first, I was terrified about drilling so many holes! But then Jason reminded me that the holes would be covered by the shelves, and if we ever took the shelves down we would have to repair the larger mounting holes, anyway. Pick a wall, pick a board, and find your studs! Make sure to use a level when marking your wall, and use a pencil lightly so you can erase any mistakes. 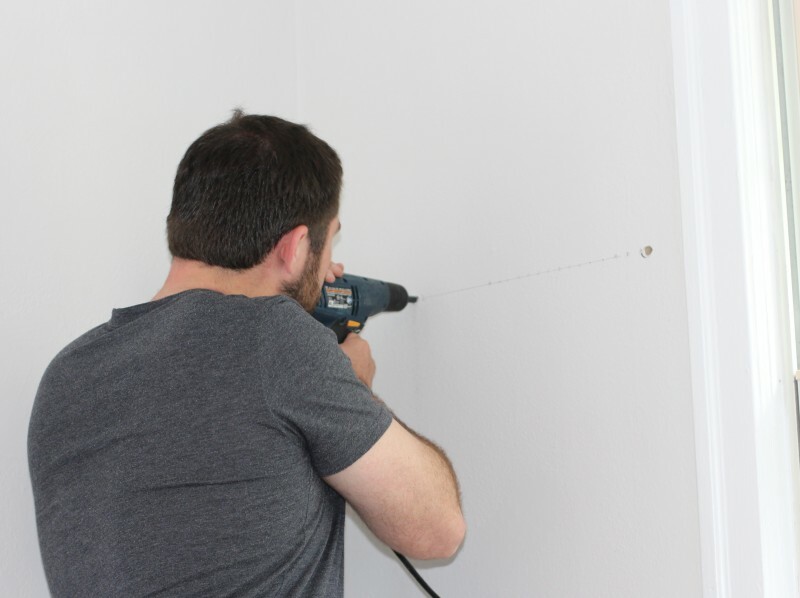 Use a small drill bit to drill into the wall and confirm that the studs are there. Make sure you find the MIDDLE of the stud. 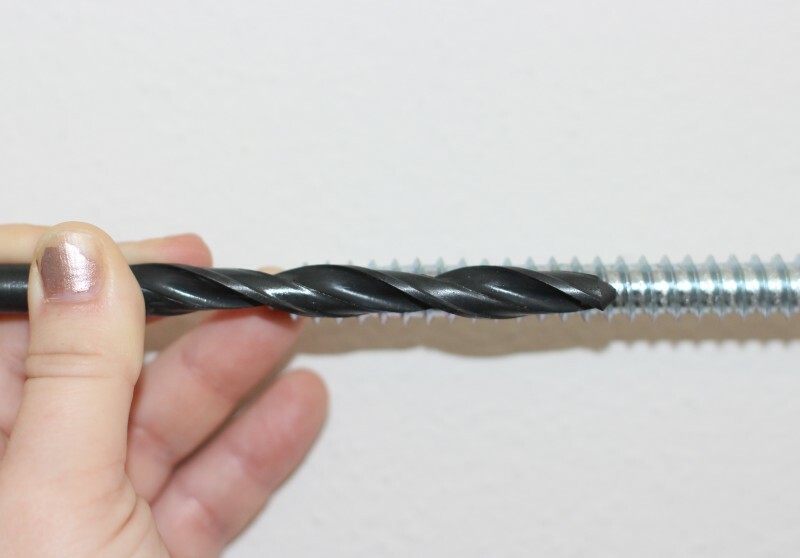 Pick a drill bit for the studs: it needs to be as big as the core of you lag bolt, but not bigger than the threads. If the bolt is much bigger than the hole it can split your stud. If its too small, it may not grip properly. We used 13/32″, but 3/8″ may work fine. Insert your lag bolts, using a heavy duty wrench or socket wrench. You want these bolts to go in tight, so a normal sized wrench will probably not have enough leverage. Just take your time, go nice and steady, and get ready for an arm workout! 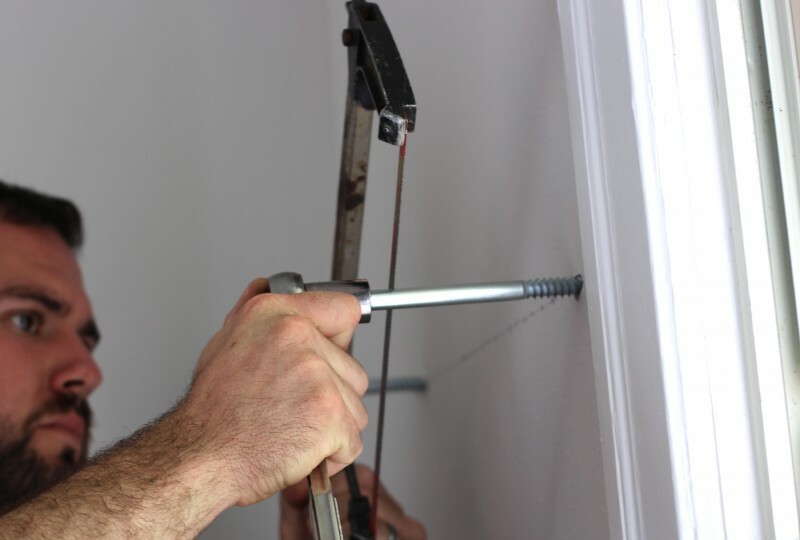 Studs are about 3 1/2″ thick, so measure your bolts beforehand to know how deep they need to go. Our plaster is over 1/2″ thick, so my bolts went about 4″ into the wall. Cut the head off of the bolts with a hack saw. 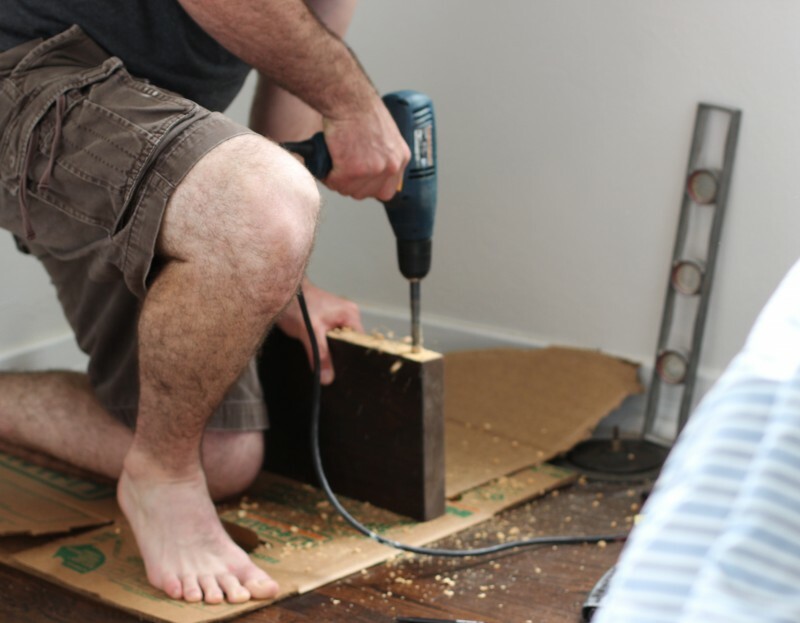 Our board was about 7 1/2″ wide, and the drill bit was about 5″ long, so we cut the studs off at about 5″. 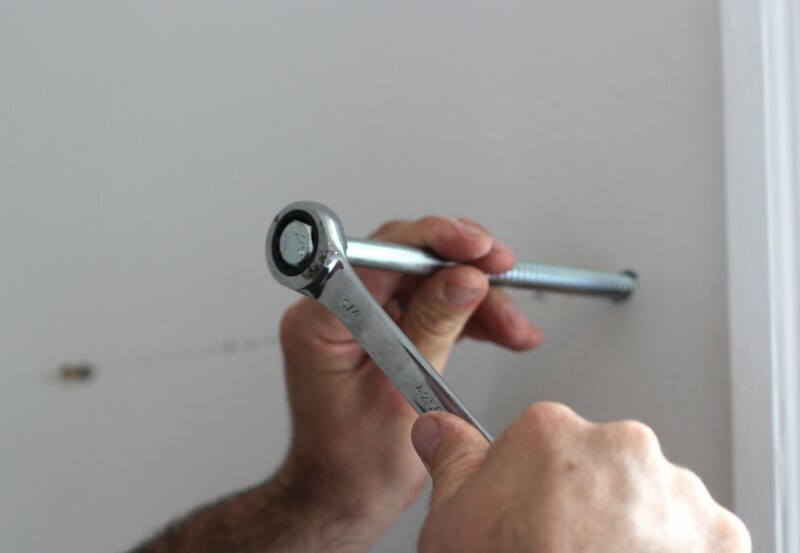 Use the wrench to hold the head of the bolt from wobbling while protecting your hand. Another good arm workout! Place the board on the wall and mark where the studs are. 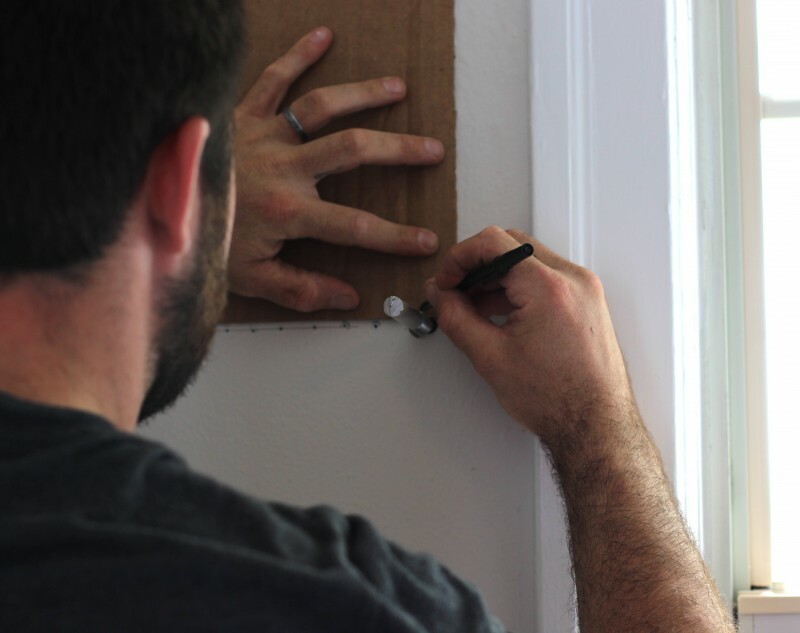 Then use a piece of cardboard and mark the center of the studs. 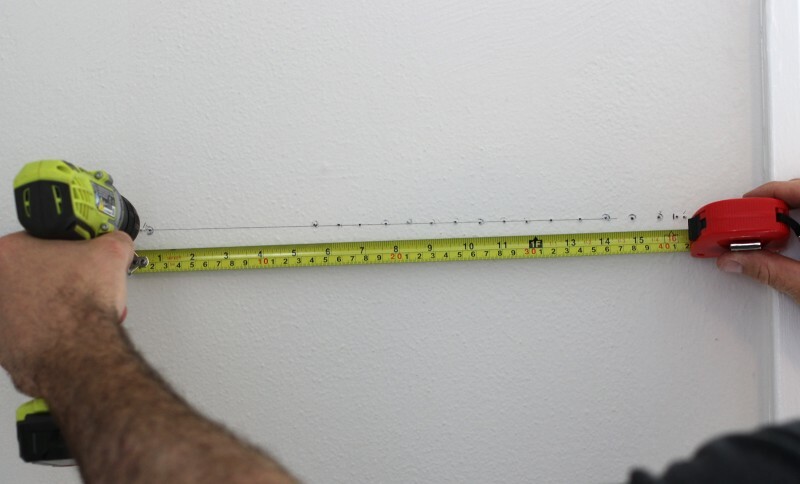 Yes, you are measuring twice. Because you want to get this right the first time! If you mess up it could ruin your board. Now drill the holes in your board for the bolts. This time you need to use a drill bit that is exactly the size of the bolts. 1/2″ worked perfect for us. You want them to slide on, but be snug. Here again, MAKE SURE that you drill square and straight into the board. Now slide the shelf on the bolts! You may have to line up one bolt and then use some force to get the other one to line up, but not much. The holes and bolts should be very close to matching, otherwise it may not work. 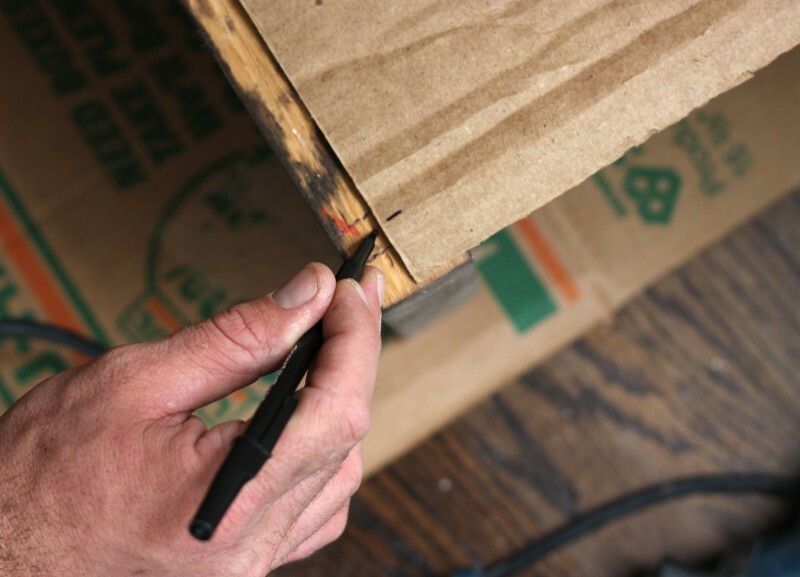 If you think one of the bolts is drooping low or tilted up, try to bend it to level before you put the shelf on. When pushing the shelf on, you may need to use some force. Jason was able to do it by just hitting it firmly with his hands, but if you need more, DO NOT HIT THE BOARD WITH A HAMMER! Instead, use a rubber mallet and a sacrificial piece of would between the shelf and hammer. 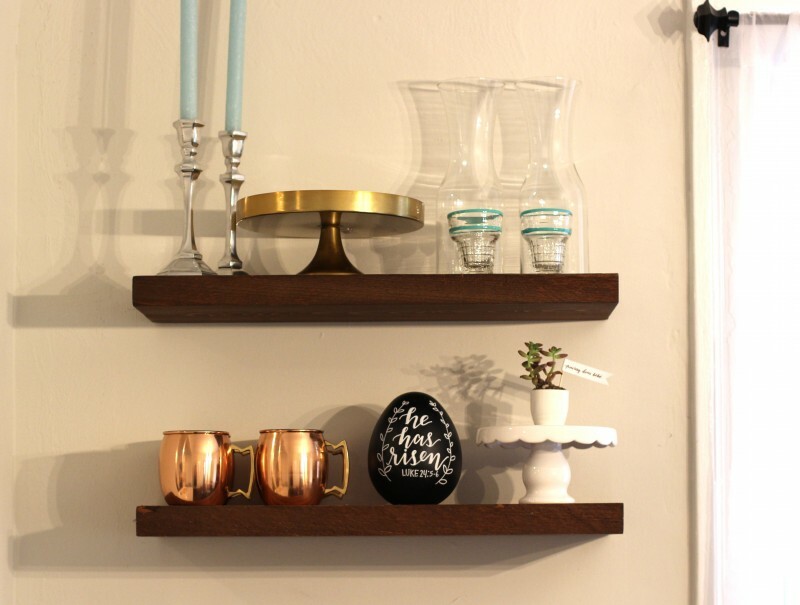 I just LOVE these “West Elm-inspired” wooden shelves. These shelves are the perfect touch of modern meets rustic. I was so obsessed with the final product that I had Jason install a shelf in the baby’s nursery. 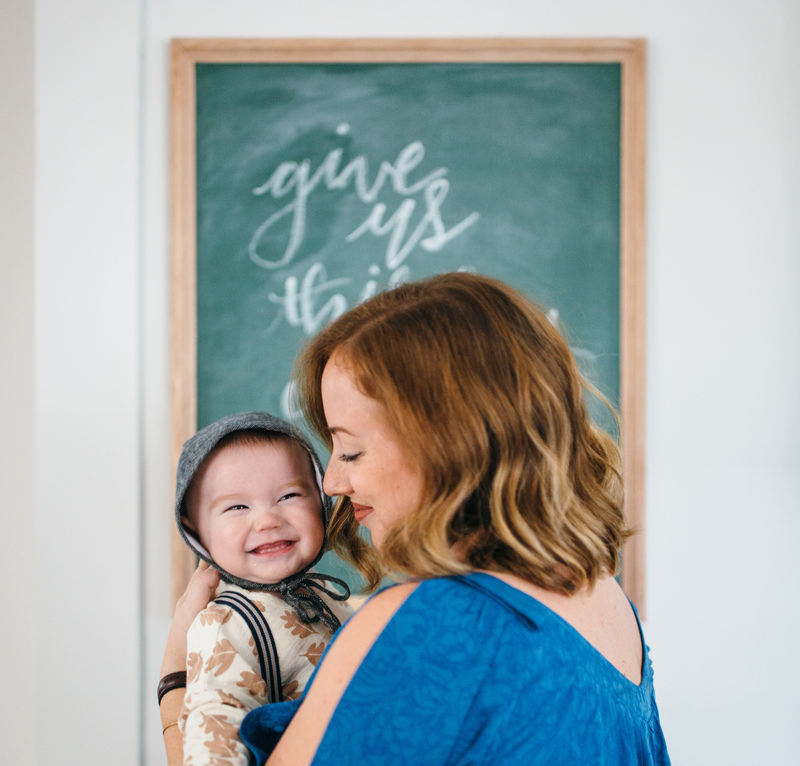 I will be sharing our baby boy’s nursery reveal in the next month.. CAN NOT WAIT! If you have any questions about creating the shelves or need clarification, please don’t hesitate to ask.